Mom’s Dream Team has finally come together for lunch! Applegate teamed up with Stonyfield and Annie's to create HALF TIME, the first pre-packed lunch kit with natural and organic ingredients. HALF TIME includes Applegate natural meats and cheeses (which have no artificial ingredients or preservatives, and are antibiotic- and hormone-free), Annie's Homegrown crackers and snacks, and Stonyfield Organic YoKids Squeezers. 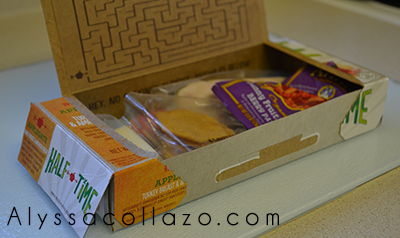 Applegate wants to take that lunch-packing dread off your hands, and give you a chance to sit back and relax. HALF TIME comes in three varieties: Turkey & Cheese, Ham & Cheese, Bologna & Cheese. Snacks from partner brands Annie's and Stonyfield are in all three. Applegate sent us a snazzy HALF TIME kit that included. All three varieties of HALF TIME: Turkey & Cheese, Ham & Cheese, and Bologna & Cheese, a draw-your-own lunch bag, a set of permanent markers, coupons, and a activity book. With HALF TIME, I don't have to compromise between convenience and quality. My girls get the "cool" appeal and I can lose the guilt. Did you know a survey conducted by Applegate found that 33% of parents would spend their time sleeping if they didn't have to make their kids' lunches in the morning. The survey also found that 88% of parents thought pre-packed lunch kits were convenient, but 79% of those parents were concerned about the nitrates, preservatives and artificial ingredients in those kits. HALF TIME is a Grab and Go lunch you can feel GREAT about! Be sure to pick up a guilt free organic lunch kit for $4.99! HALF TIME is available nationwide at food retailers such as Target, BJ's, and Safeway. A product locator can be found here. And now it's YOUR turn to spread the word about HALF TIME the first natural and organic lunch kit. 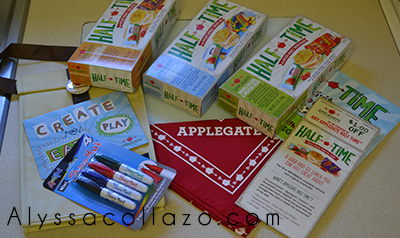 Applegate is giving ONE of my lucky followers the chance to win a Snazzy HALF TIME kit of their own! Applegate HALF TIME Giveaway: One (1) winner will receive: a HALF TIME kit. Ends 10.1.14. a Rafflecopter giveaway DISCLAIMER: All products received are complimentary for testing purposes from Applegate. All opinions stated are my own and are not influenced by any affiliates. I like that it is organic! Thanks for the great give away. Who doesn't like free stuff? It cuts lunch prep time in half every morning, I could sleep an extra 15 mins!! I pack 18 lunches a week - a would LOVE a break! I love those two brands and that lunch kit is pretty cool. Great giveaway. These are great for the kids when you're in a hurry. We've got soccer and Cub Scouts going on, and these would be great hold-me-overs until we can get home for dinner. I love things that are convenient and easy.Half time = snack time. Nothing makes me happier than a giveaway! love this.. food in a hurry is something I am always looking for! My favorite thing about HALF TIME is that it is natural and organic and a perfect lunch kit for anyone on the go especially with the kids. Half Time is great. I love that it's natural and organic. My daughter is grown and moved away, but I think I'll get these for myself. This is so great for kids AND adults! It's so great to have a handy, all natural, all organic lunch waiting for you. Awesome. Those are both great brands. I definitely want to give these a try! This really gives you a healthier lunch alternative. It's also more convenient having your meals this way. It gives you more room to plan your diet. I love Applegate products because I recognize everything in their ingredient list. My kids love these. I stuff these in their backpacks for snacks. I like how easy it is.. this would work out great here. I really love how simple this is! & packed with organic goodies too. My kids would LOVE to have these packed for their school lunches! What a wonderful treat for moms like me. I usually hate prepacked lunches but these look like they would be mom approved. Thanks for the giveaway! My fav thing is that it is easy! I have been wanting to try them for my kiddo! Looks like a great lunch kit. This is the first time I'm hearing about Half Time. I love these lunch kits because they are healthy for the kids. I will have to get all three for the kids to try. These will be convenient also. Thanks for sharing. These look like great after school/ in between sports snacks to have on hand. Thanks for sharing! nice lunch kit. They will help busy mamas with school lunches. Love organic boxes. This looks super good. I love the antibiotic free meat and cheese! Wow! I never heard about this before. The half time kit sounds awesome! Great giveaway! It's nice to know that there is pre-packed lunch kit with natural and organic ingredients. If you ever look at some of the other pre-packed kits, they are full of sodium and a lot unknowns. Thanks for sharing, I'm going to get some of these! I will check these out, they would make a great snack. I like the fact that they are organic and are a great price. These look like awesome kits. I would love these for my daughter. Thanks for the giveaway. We love eating healthy food and of course organic food tops the list in our grocery items to buy every week. I'd like to join but I'm not living there. Price isn't bad, organic, healthy and for kids! BINGO we have a winner right here! LOL Those meals look delicious! My favorite thing is that is a guilt free organic lunch. The price seems reasonable too. I've never seen these before but they look really good. I bet they would make a good lunch for my husband. Wow! This is such a cool idea! I love the games and food they packed inside! Wow! An organic product! Great for those kids who's having lunch at school! Great idea having prepacked lunches. Just not very good with all the packaging vs packing your own. Those looks really good. I can't wait to get my package, I bet my kids are going to love them. Thanks for the great giveaway! Great post and review. I find it very interesting. This is so cool. Nice giveaway. I like that they're affordable and organic! Great lunch option for clinical days for me! I love these! I love knowing I am sending my kid with good food! I like that it is a healthy, balanced, all-in-one meal for their lunches. Healthy organic way to go! Did you say guilt free organic lunch? Sold! What a great box of goodies! A nice healthy selection! Love it! Love all the healthy choices! Okay I totally want to try these I love Applegate meats I always pick them them up at Whole Foods. I will have to check if they have any of these there. i am not familiar with the product but they looks yummy love the bologna and cheese! I like the variety and convenience. I like that I wouldn't have to think to pack something, just grab and go. I like that it's all in one box. We don't have these stuff in our country. Good luck to all joining the giveaway! I like that they are a healthier alternative that might inspire some serious changes in diet. These are great for the kids when you're in a hurry. My favorite thing is all the great munchies!! That it is not a Lunchable! What garbage that stuff is. This is something I would be proud to give my children.